In our last blog post, we talked about three mistakes that you might be making with your bathroom lighting. We hope that if you found that you have made some of those mistakes, then you’ve been able to correct them. At Southern Lights, we’re proud to be Minnesota’s premier lighting showroom, and if you’re looking for new lights, then we hope you’ll visit us soon. There might be other rooms in your house that need some lighting attention, such as the bedroom. If there doesn’t seem to be enough light or your fixtures are starting to look outdated, then let our expert staff help you choose new options. 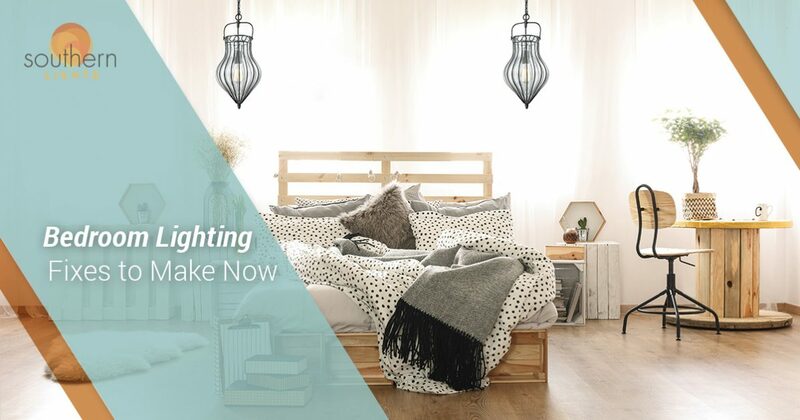 In this post, we’ll look at some bedroom lighting fixes that you can make right now. If you’ve been living with incandescent light bulbs for the past few years, then why not make the switch to LED or CFL bulbs? These new, energy-efficient bulbs are a great investment, and while they may cost more up front, they’ll end up saving you in the long run. LED bulbs can last for years, and they can provide much brighter light than their incandescent counterparts. Our staff is well-versed in which bulbs will be right for your bedroom lamps, ceiling fixtures, and more. No matter what bulb size you need, our showroom will be able to supply it. Your bedroom ceiling fan has been keeping you cool for many years, but it may be starting to look a bit outdated. You might not like the look and feel of the globes or shades on the light kit, and it may have been the previous homeowner who installed the fan. 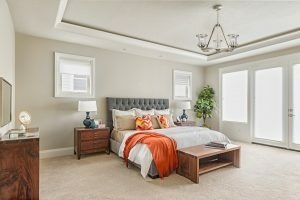 Changing the ceiling fan can create a new focal point for the room, and you can update the style of fan that you have and make your bedroom feel more contemporary. Your current fan may be making more noise than it used to, and replacing it now can help you sleep better during those warm summer nights. When you walk into your bedroom, you might turn on all the lights with one switch. The ceiling light comes on, and so do the wall sconces and the floor lamp that’s plugged into the wall outlet. By adding new controls such as dimmers and timers, you can set the mood by only turning on the sconces, or set the light levels where you want them. If your lamps come on with a switch, then consider plugging them into timers so that they turn on when you want them to, instead of every time you’re in the room. If these lighting tips spark some inspiration for your bedroom, then we hope you’ll visit our showroom today. At Southern Lights, we’re dedicated to helping every customer find the lights they need at prices that fit their budget. You can stop by Monday through Saturday to speak with a lighting expert, or you can use the form below to contact us online.